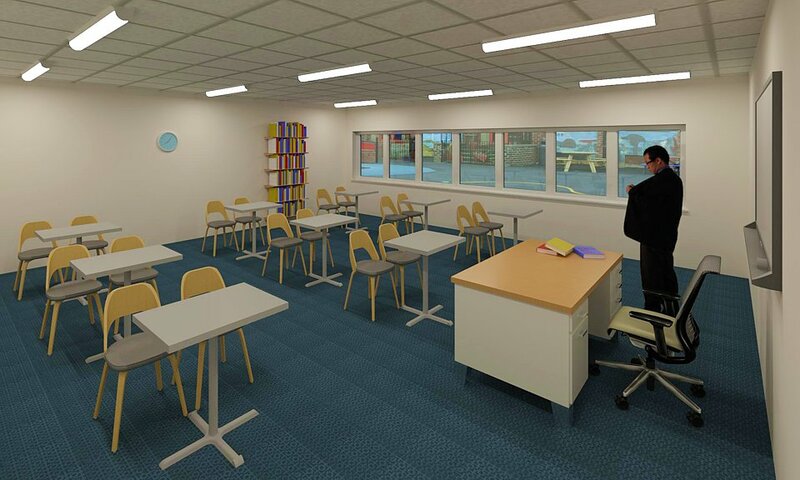 The Genius Education system provides a quick and easy solution to your classroom requirements that will reduce energy costs whilst increasing user convenience. Built around a lighting control module loaded with pre-configured classroom scenes, the system allows simple scene adjustment to suit a host of different classroom scenarios. Incorporating graduated dimming, the system offers maximum energy savings whilst being very easy to install. Using the pre-fixed connecting leads on each luminaire enables quick connection to the lighting control module and significantly reduces installation time. The system comes complete with luminaires, microwave detector, lighting control module and connecting leads, with an optional scene plate for simple scene selection. A wide range of recessed, surface mounted and suspended luminaires are available on request for the Genius Education system. All the luminaires are supplied complete with plugs on 8m leads to enable easy, plug and play installation. Scene plates and detectors are supplied with 10m leads. Ideal for maximising the use of daylight within a space. The luminaires will progressively dim from the natural light source, in response to changes of the natural light levels. This prevents over lighting the space and minimises energy consumption. Recall a pre-programmed scene to create specific lighting scenes to suit different uses within the classroom environment, a white board scene. Commissioning is easy with the Genius Education system, simply select the configuration you desire on the handset and send to the LCM and you have a complete commissioned system. Perfect for quick re-commissioning when there is a change in the room usage. A local emergency test can be carried out by adding an emergency test switch to the dedicated SELV input. This can be linked across multiple lighting control modules to enable a number of rooms to be tested from a single key switch. By connecting the corridor hold output between multiple lighting control modules, create a simple notional corridor route which will provide safe local egress lighting. The lighting control modules can have up to 5 centre biased retractive switches connected, including an emergency lighting test switch. This allows non-mains rated cabling to be used for the manual switches without the need for mechanical protection. Classroom with 3 rows of luminaires working in absence mode. Whiteboard on channels 1, 2 and 3. SW1, SW2 & SW3. Each switch operates luminaires within the same colour group. Whiteboard Switch. Switches and dims the whiteboard luminaires within the associated group. All luminaires are dimmable, with daylight linked graduated dimming from window row. Upon exiting the space any luminaires left on will switch off after an adjustable time period. Classroom with 3 rows of luminaires switched individually. Whiteboard on channel 2. Scene plate by teacher's desk. Detector for lux (scene 1 only) and absence. Whiteboard Switch. Switches and dims the whiteboard luminaire independently. All luminaires are dimmable, with daylight linked graduated dimming from window row on scene 1 only. Scene Setting 1. All luminaires at 100% (with graduated daylight link). Scene Setting 2. All luminaires at 75%. Whiteboard luminaire switched off. Scene Setting 3. All luminaires at 50%. Scene Setting 4. All luminaires at 25%. Use the options below to define your Genius Education solution. An ASENS-CHSLCD Advanced LCD Programming Handset MUST be ordered to enable selection of pre-programmed scenes. 11 × ASENS-CHSLCD MUST be ordered to enable selection of pre-programmed scenes.